In April of 2011 the River Region Photography Association displayed photos in the Hart-Stepp House, one of the oldest houses west of the Mississippi River. 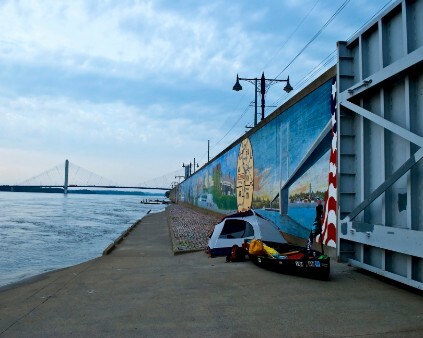 The theme of this exhibit was "Life on the Mississippi." Here are the photos that I displayed, plus a few others. I hope you enjoy them. Email me at dbuckenmyer@mindspring.com if you would like to purchase any of them. 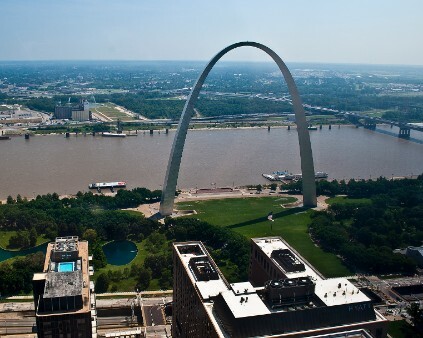 The Jefferson National Expansion Memorial Park with the Gateway Arch, Mississippi River and Illinois beyond. 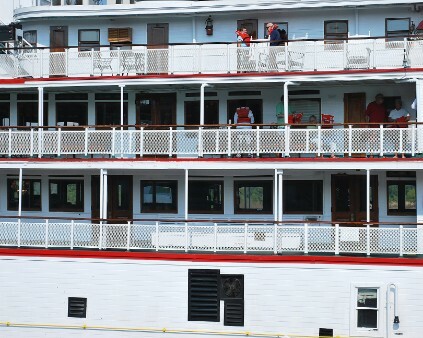 True "life on the river." 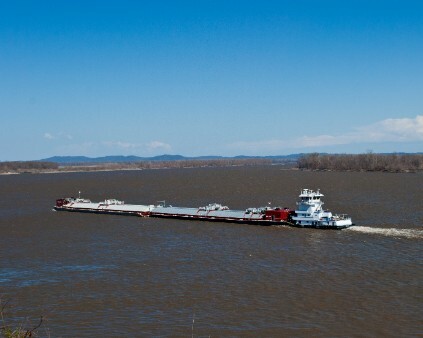 A towboat pushes barges upriver at Cape Rock Park, Cape Girardeau, Missouri. 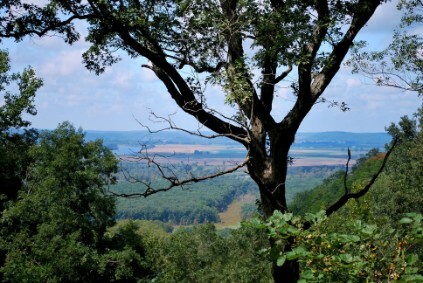 A view from atop the LaRue/Pine Hills Conservation Area in Southern Illinois, with the LaRue Swamp below and the Mississippi River and Missouri beyond. 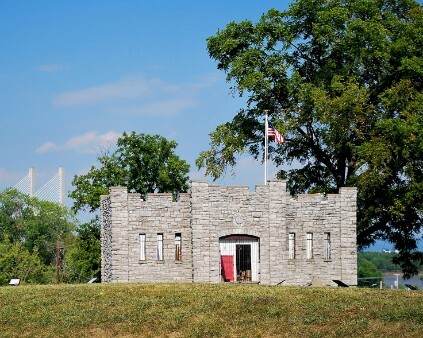 Civil War Fort D in Cape Girardeau, Missouri, with the Bill Emerson Bridge and Mississippi River behind it. 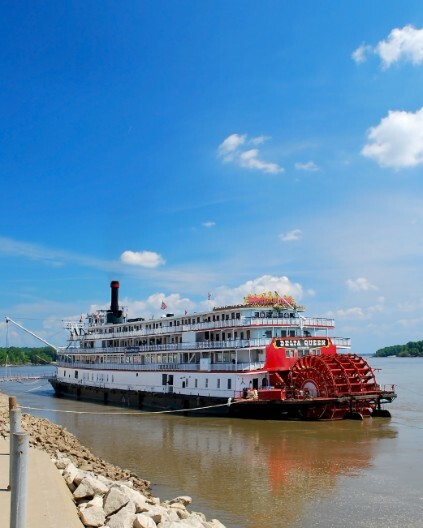 Delta Queen Paddlewheel River Boat moored at the Cape Girardeau Riverfront Park. 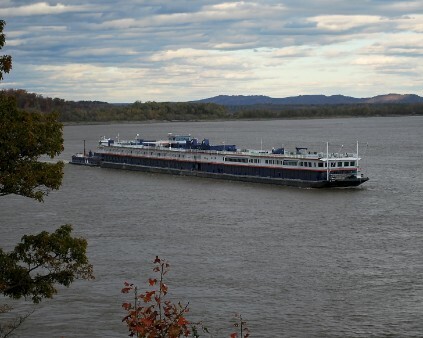 Traveling the River the old fashioned way, Riverfront Park, Cape Girardeau, Missouri. 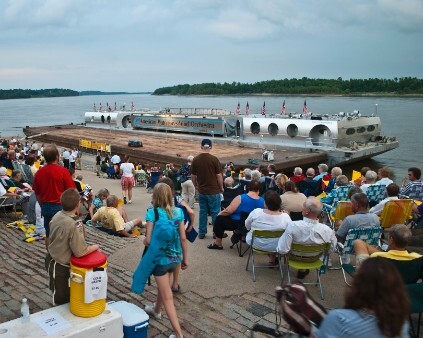 The American Waterways Wind Orchestra barge docked at Cape Girardeau on its fairwell tour. 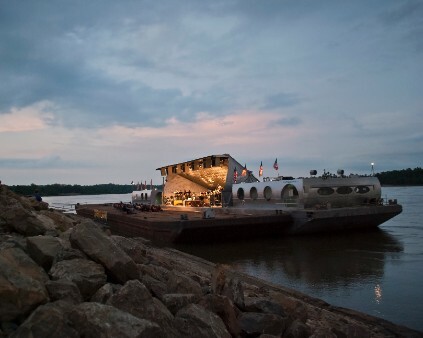 The American Waterways Wind Orchestra's barge, the Point CounterPoint with the Orchestra Playing one of its final conserts. 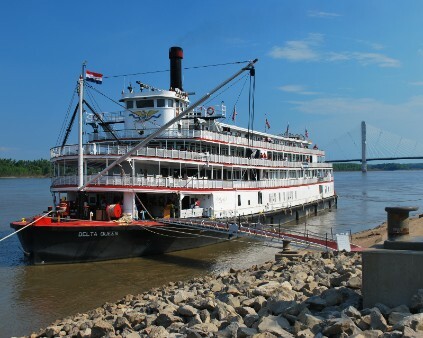 The Delta Queen paddlewheel river boat docked at the Cape Girardeau Riverfront Park. 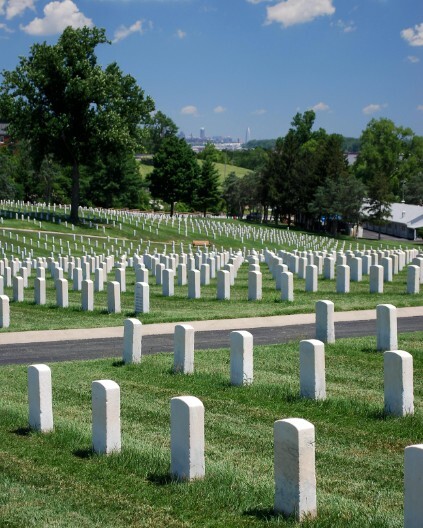 Graves of military servicemen and women at the Jefferson Baracks National Cemetary in St. Louis, Missouri, with the Gateway Arch and Mississippi River in the background. 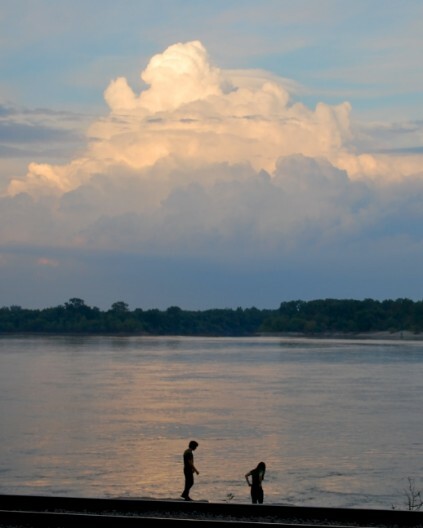 A young couple check out the railroad tracks and a flooded Mssissippi River after a summer thunderstorm. Lower Cape Rock Park, Cape Girardeau, Missouri. 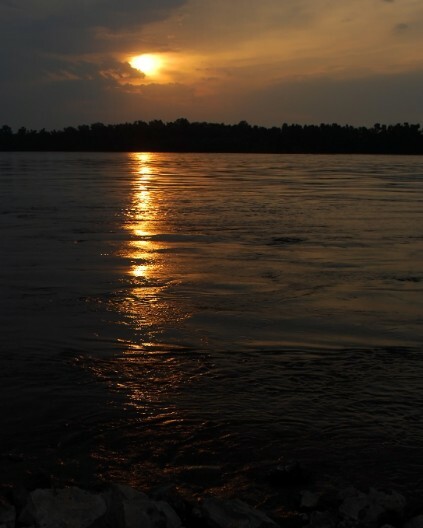 Sunrise on the Mississppi from the Cape Girardeau Riverfront Park. 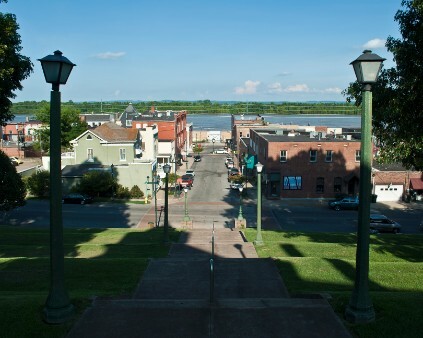 Downtown Cape Girardeau and a flooded Mississippi River from the Common Pleas Courthouse.